What stanzas are the most surprising or interesting to you? Why? What “rules” of poetry is he following? What rules is he breaking? What kind of person do you imagine him to be? As I walk around the room, I hear rather more surprised giggles and shudders than I expected. So far it’s been a year of explaining punchlines–spending hours laying foundations for why this book or that poem is important, funny, interesting, ironic–so I’m pleased to see them engaging with something without much introduction. When we come back together as a class, the first two questions uncover more questions than answers (Why did he write this? What does he mean by “I am the poet of a woman”? What even is poetry? Does this really count?). The third, however, provokes the most interesting images. “If he walked in here, what would he be like?” I prompt them. All this from a few stanzas of an image-rich and narcissistic 19th-century poem. It strikes me once again that teenagers get less credit than they deserve. I had a professor in college who doubted that teenagers could truly study literature (apparently forgetting that half of her students were still teenagers, and a solid third were studying to become teachers), saying with a shrug that maybe books could only be enjoyed, not truly understood by high school students. Confession: There are days I that wonder. Days that I spend hours dreaming up how to make Hawthorne more interesting or Emerson more transparent, or planning how to introduce The Great Gatsby so that my students give it a chance. Teaching a chronological survey of American Literature, I spend the whole first quarter of each year explaining (and sometimes apologizing for) archaic language. Wouldn’t it be easier to read things they like? Books that are accessible, or poems that have helpful rhyme and easy metaphor. Surely there’s value in that, though not the value of shared tradition or intellectual challenge. 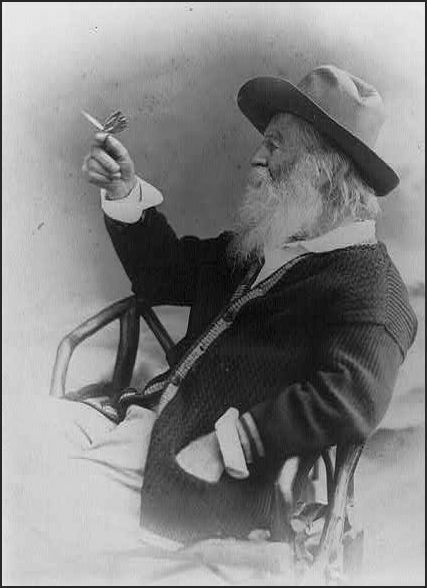 Instead, I teach Walt Whitman to young people who may not understand it, and discover for the thousandth time that understanding can take many forms. They may not be ready to write their doctoral theses on Leaves of Grass, but they know our Walt, walking through the door with a firm handshake and a genial manner. When they’ve finished with “Song of Myself,” they begin on “When I Heard the Learn’d Astronomer.” After most of them have read the eight lines, I hear an exclamation of delight from the front of the room. “What’s he saying?” I ask him. I remember their imaginary friend Walt, their chorus of voices mesmerized by his odd ode to himself. I could have lectured, could have taught the poem. Instead, they read it, looking up at the stars until they understood. Or understood enough for now. And today it’s the small epiphanies I love. I wish you’d been my English teacher… I’d be a better person for it! Thanks for another great post.